Streetlight Manifesto is heading to South America! 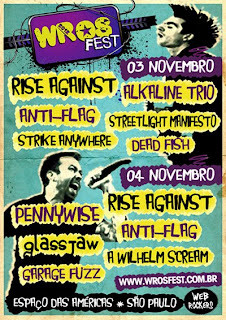 We'll be in Sao Paolo, Buenos Aires and Santiago with the WROS Fest, a big ol' punk rock festival featuring big names like Pennywise, Rise Against, Alkaline Trio, Anti-Flag, Strike Anywhere, A Wilhelm Scream and more. I can't wait! My last time (and first time) in Brazil was amazing but grueling: so many airports/vans and so little sleep, plus it was their winter. This time we're going at the start of their summer and the accommodations should be much nicer, plus I get to see Buenos Aires and Santiago! Yes.